Once in a while I get a really strange burst of traffic. Today I've had over a hundred unique users from Mexico, all looking for information on "the king in yellow" or "the yellow sign". Something odd is going on in Mexico to get that many searches, but I haven't seen anything in the news to give me a clue what it is. Update: Based on all the comments, it looks like a "King in Yellow" -centric episode of "True Detective" is responsible for the sudden flurry of interest. My thanks to everyone who helped out. That explanation is far better than the one I envisioned involving a fringe cult. 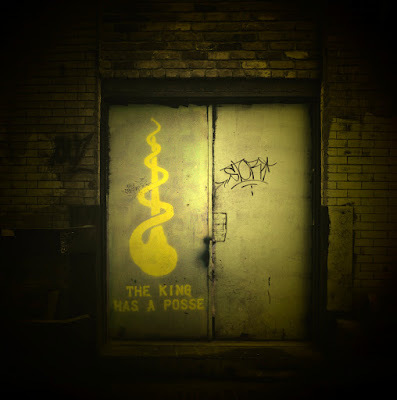 A recent episode of True Detective season 2 seems to have referenced the King in Yellow and Santa Muerte, so people who know one of those are probably now researching the other. You know it’s funny, because lately I have been getting a ton of hits from Russia on old apocalypse kit post from back in 2012. Do they know something we don’t? I think it might have something to do with True Detective. There's an ebook on Amazon called The King in Yellow and Other Stories: Tales of the Carcosa Mythos, and the blurb for it says "The new hit television series True Detective contains numerous references to the works of late 19th and early 20th century weird fiction writers Robert W. Chambers, Ambrose Bierce, and H. P. Lovecraft. This anthology, edited with an explanatory introduction by a noted weird fiction scholar, collects the tales of those writers that are relevent to True Detective." I've never watched True Detective, but once I've read the book I might give it a try. I wonder if the first season of True Detective is trending down in Mexico? It's a Pulverized Meat Miracle!